MEEKER | The lady Cowboy basketball team started 2018 by doubling the two-game win streak of 2017, crushing the West Grand Mustangs 51-25 and coming from behind to pound the Hayden Tigers 48-28. After the two league wins, Meeker played in Baggs, Wyo., Tuesday, will play in Rangely tonight, and will then host the North Park Wildcats, Friday. Against the Mustangs, in the first game of 2018, Meeker led 11-9 after the first period, then started to break the game open in the second period, leading by nine at halftime. Meeker defense only allowed the Mustangs to score eight points in the third quarter and just two in the fourth. Victoria Lasker finished with a double/double, scoring a team high 12 points and pulling down 10 rebounds, as well as stealing the ball five times. Megan Shelton scored nine points and led the team with 14 rebounds, while Kenzie Turner scored seven points and had seven rebounds. Julia Dinwiddie scored six points against the Mustangs, as did Sierra Williams, while Dinwiddie recorded 12 rebounds. Against the Tigers, Meeker found themselves behind at halftime but came back strong in the second half to win by 20 points. Meeker finished the game with 26 steals, including six by Shelton, who also led the team with 19 points and 13 rebounds. Lasker finished the game with 11 points, Dinwiddie and Gracie Bradfield each scored nine, while Turner and Lasker each recorded five steals and Bradfield stole the ball four times. 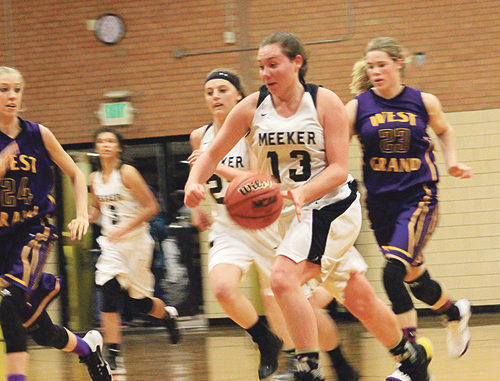 Meeker (5-3) will play the lady Panthers (6-2) tonight in Rangely, then host the North Park Wildcats from Walden in another Western Slope League contest Friday.